The State Department's Office of the Inspector General had just released its inspection report of the US Embassy in Valleta, Malta. The embassy was the temporary safehaven location during the evacuation of US Embassy Tripoli weeks ago. It is one of the nine posts identified by the State Department to remain open at 100% staffing in the event of a government shutdown due to what it calls the "extreme nature of events." Malta is a small island country located in the south-central Mediterranean, astride some of the world’s busiest shipping lanes. It joined the European Union in 2004, the Schengen visa system in 2007, and the Eurozone in 2008. With a population of 412,000, it is the smallest country in the European Union. The country is overwhelmingly Roman Catholic, with a Christian culture that reaches back to the beginnings of the church. Reflecting the church’s continuing influence, abortion and divorce remain illegal. There is a small Muslim population of about 10,000, almost half of whom are migrants from sub-Saharan Africa. 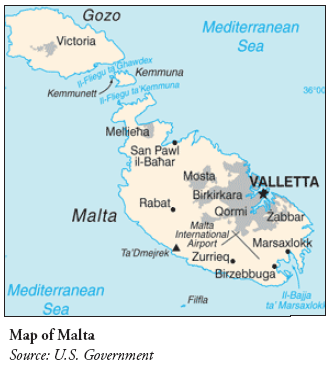 Maltese and English are the official languages; English is widely spoken, a legacy of 150 years of British colonial rule between 1814 and independence in 1964. The Ambassador had been at post more than a year at the time of the inspection, and had achieved some policy successes. He is respected by Maltese officials and most mission staff, but his unconventional approach to his role as ambassador has created friction with principal officials in Washington, especially over his reluctance to accept their guidance and instructions. Based on a belief that he was given a special mandate to promote President Obama’s interfaith initiatives, he has devoted considerable time to writing articles for publication in the United States as well as in Malta, and to presenting his views on subjects outside the bilateral portfolio. He has been inconsistent in observance of clearance procedures required for publication. He also looks well beyond the bilateral relationship when considering possible events for the mission to host in Malta. His approach has required Department principals, as well as some embassy staff, to spend an inordinate amount of time reviewing his writings, speeches, and other initiatives. His official schedule has been uncharacteristically light for an ambassador at a post of this size, and on average he spends several hours of each work day in the residence, much of which appears to be devoted to his nonofficial writings. At the same time, he has not focused sufficiently on key management issues within the embassy, including the NEC. The Ambassador advised the inspection team that he intended to discontinue his outside writings and focus on matters that directly pertain to the embassy and priorities outlined in the Mission Strategic and Resource Plan (MSRP). Within weeks of the team’s departure, however, he resumed drafting public essays that addressed subjects outside his purview as Ambassador to Malta and detracted from his core responsibilities. These activities also detracted from the core responsibilities of embassy staff members who devoted time and effort to reviewing and editing the ambassador’s drafts and seeking approvals occasionally after the writings had been submitted for publication from Department officials. The major challenges facing the embassy are the scheduled May 2011 move to the NEC and the additional staffing it will require. The new $125.5 million compound consists of eight separate buildings on 10 acres. The new chancery will be approximately twice as large as the current one, and more than twice as expensive to operate. The NEC will require a 60 percent expansion of LE staff, primarily guards. The NEC also has budget implications for the embassy and the Bureau of European and Eurasian Affairs. The embassy’s budget grew from $3.8 million in FY 2009 to $5.5 million in FY 2010. The projection for FY 2011 is $8.5 million, an increase of 125 percent in 2 years. In 2010, utility costs for the current chancery were about $130,000; utility costs for the NEC could reach $1.2 million annually, a 10-fold increase. Landscaping and cleaning contract costs also will increase significantly. Upon completion, the 57,264-gross square feet chancery will provide a secure and functional space for the 62 employees for whom it was designed. The inspection team was surprised by several features, including three unclassified conference rooms, a political-economic section suite that will house just one officer, and a large IRC whose usage will be limited by the NEC location. The building also has air handling equipment within the controlled access area that will require cleared escorts for every maintenance and repair. In addition to the chancery, the compound also will have a 17,760- gross square feet warehouse, a 6,781- gross square feet Marine security guard quarters, and a 1,227- gross square feet recreational center, as well as a 2,142- gross square feet swimming pool. Employees at Embassy Valletta have been receiving rest and recuperation (R&R) travel benefits since at least 1991, the year the last R&R recertification could be located in embassy files. U.S. direct-hire staff on 3-year assignments receive two R&Rs, and entry-level officers on 2-year assignments receive one R&R. According to 3 FAH-1 H-3721.4, all posts that receive R&R are required to submit documentation every 2 years to the appropriate regional bureau executive to justify continued eligibility. Embassy Valletta has not done so. The inspection team found no evidence to justify continuing R&R. The post’s own report of conditions cites excellent weather, adequate medical care, good local transportation, and easy access to Europe. In FY 2010, the Department spent about $40,000 to fund R&R travel for employees in Valletta—an unnecessary expense. Oh dear! A tiny island in the middle of the Med. And no getting off for three years, folks! Forbes quotes Ambassador Kmiec saying he would not apologize for how he has conducted himself in the job. And might just be coincidence, of course -- Pepperdine Graphic.com published Mr. Kmiec's email (also Pepperdine Law Professor) about that rescue effort the mission conducted with US Embassy Tripoli -- headlined, "Ambassador Kmiec leads dangerous rescue:"
Former Secretary James Baker (a friend from my days as Ronald Reagan's constitutional lawyer) was so impressed with our rescue work that he wrote me, "It appears that you have been very busy ... It was nice to read the positive words that Prime Minister David Cameron said about your leadership." Apparently, Secretary Clinton feels the same way since when the budget deficit was looming and no budget threatened to close down virtually the entire federal government, except for a handful of exceptional services, our Embassy in Valletta was one of a handful of embassies around the globe deemed "essential" and not to be shuttered. I've read the OIG report front and back, nothing there that says he cannot have his expressions of faith, I presumed the inspectors just wanted his eyes on the core goals of the embassy -- after all that's why we, the taxpayers pays for him and his staff to be there: strengthening maritime security, promoting U.S. trade and investment, the enforcement of nonproliferation sanctions against Iran and other countries that use Malta’s shipping facilities, trafficking in persons and attending to key management issues within the embassy. Based on the above, I doubt if this political ambassador is going to change how he does his job. One more WH headache, which I suspect will be tolerated given the much bigger headaches out there. Those at the Bureau overseeing Malta will probably just have to live with this, I mean, what else can they do, eh? May need lots of Aspirin.